So last week I had a client with a last-minute request. Some guys from the office were popping over to the boss’s house for a working lunch. Working lunch with this crew doesn’t mean sandwiches… it means a sit-down, take a few bites, talk strategy and plan, then continue eating, lunch. The challenge was 1. Quick 2. Not Sandwiches 3. Still tasted good room temp. 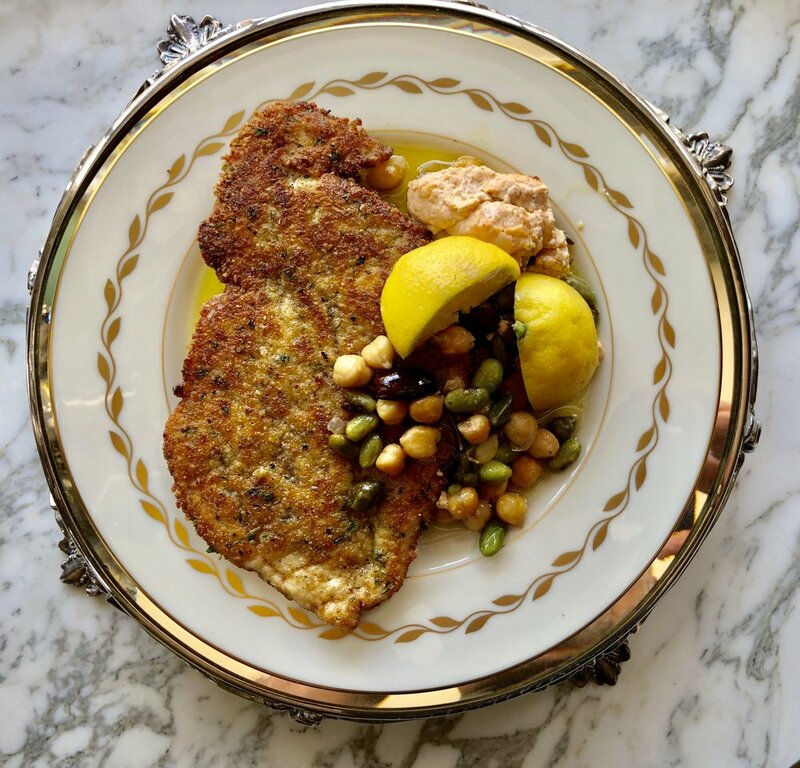 Ina Garten (The Barefoot Contessa) has an easy herbed breading recipe that is perfect for pan fried cutlets, and that is my go-to when needing something quick. Now I like to put my own spin on her recipe, namely hitting the mix with ITK’s Cooks Line Seasoning, but also combining standard fine bread crumbs with Japanese Panko (you know, the crunchy stuff). As far as the herbs go and what kind… I’ll leave that to you. For this particular dish, I used dill, parsley, and thyme. Sage, oregano, or rosemary would be great as well. A great way to use those herbs in your summer garden! Chicken cutlets or pork (I use pork tenderloin) cutlet it makes no difference with this breading. What does make a difference are two things: 1. Pounding those cutlets nice and thin.. like you would with Wiener Schnitzel 2. Setting up a proper breading station (flour, egg, breading, in that order). Why this particular breading station? Well, the different components maximize the flavor, moisture level, and texture of whatever you’re breading. Sealing in all of that on a thinly pounded out piece pf meat makes all the difference. So for the olive oil braised beans… clearly going the Mediterranean route on this one… well, maybe except for the Edamame, but you get the idea. Shelled broad-beans aren’t always readily available in my neck of the woods, but frozen shelled edamame beans are. Loaded in vegetable protein, braised in good olive oil with punches of flavor from capers and earthy kalamata olives, this dish is your no ordinary “baked beans”. The kicker on this dish that I loved was the “smoked ricotta”. Not only because I use my “Little Bit More” spice blend, but the smokiness form the smoked paprika and the creaminess of the ricotta add another flavor level and evens out the punch you get from some of the brined ingredients. It is pure magic, and I’m sticking to this for ever and ever. Alright gang, let’s get after it. I hope you enjoy this hungry man meal as much as I did. Oh and hey.. picnic lovers… this is a great picnic meal. Cook, chill, eat outdoors room temp. It’s perfect! Add a little butter to your oil when shallow frying... adds flavor and richness. In a large mixing bowl combine the two breadcrumbs, parmesan, minced herbs, and “Cook’s Line Seasoning”. Stir to combine evenly. Set up your breading station: Flour in a shallow dish, next to that your beaten eggs in another, then your herbed breading in a separate bowl. On a flat, clean, surface, suitable for “flattening” meat, lay out one half of your butterflied chicken breast. Spritz the top with a little cooking spray and pay a piece of plastic wrap over the top. With a meat mallet or rolling pin, pound the chicken out as flat as you can get without it falling apart. In a fry pan begin heating a glug or two of the olive oil. Add a knob of butter for richness if desired. Dredge a thinly pounded chicken breast in the pain flour coating it completely. Dip in the heated egg coating both sides, then pass off to the herbed breading mix coating it well. Gently lay the coated chicken breast in the hot oil and shallow fry 2-3 minutes until the edges are nice and crispy. Gently turn over with tongs and fry the other side an additional 2-3 minutes until the cutlet is golden brown and cooked all the way through. Lay the cutlets onto a platter line with pepper towel to soak up any excess oil and butter. Serve hot or warm… great both ways! Adding the olive oil for braising. In a sauté pan add a couple of tablespoons of olive oil and begin to heat on the stovetop. Add the finely chopped red onion and minced garlic then season with the Soul-Licious Seasoning. Cook slowly until the onions are tender. Add to the bottom of a medium-sized rectangular baking dish. In a large mixing bowl combine both beans, chopped rosemary, lemon zest, capers, and halved Kalamata olives. Toss to combine and then pour into the baking dish. Pour the one cup of olive oil over the top of the beans, give the dish a little shake, and add a few thick slices of fresh lemon on top. Cover with foil and place in a 400-degree oven for 45 minutes. While the beans are braising begin mixing the “smoked ricotta”. Place the two cups of whole milk ricotta in a small mixing bowl. Add the juice from the large lemon and mix to a creamy consistency. Set aside. After 45 minutes remove the beans from the oven and remove the foil top. With a large dinner spoon, spoon out the smoked ricotta cheese and dollop the top of the beans. Place the beans back into the oven and let them bae uncovered an additional 15 minutes. This set the ricotta and brown the top of the beans a bit. Serve as a side dish with the breaded chicken cutlet, or on its own cold, with fresh chopped cucumbers, as a delicious summertime salad!